Land tenancy in Cuban agriculture has experienced three pronounced changes since the beginning of the revolution in January 1959. The first agrarian reform law was enacted in May of that year. It proscribed the latifundia (described as estates larger than 405 hectares), and initially distributed some land and encouraged the development of cooperatives on large estates. Most of these cooperatives, however, had been converted into state farms by 1962. The second agrarian reform law, enacted in October 1963, expropriated the land of most farmers with more than 67 hectares. The state then became the owner and manager of the vast majority of Cuba’s agricultural lands. This situation lasted exactly thirty years, until the creation of the Basic Units of Cooperative Production (UBPCs) in October of 1993, which is considered by many as a third agrarian reform. The objectives of this paper are: (a) to summarize the causes and effects of the current Cuban economic and agricultural crises; (b) to study in some detail the organization and operation of both UBPCs and new agricultural markets; and (c) to discuss the implications of these changes for Cuba’s future agricultural productivity. In mid-September of 1990, Cuban officials announced that the country was entering a “Special Period in Time of Peace” as a result of the demise of socialism in Eastern European countries and the changes taking place in the Soviet Union. The subsequent collapse of the Soviet Union and of the Council for Mutual Economic Assistance (CMEA) eliminated the framework within which the majority of Cuba’s commerce and economic activity were taking place. At the end of the 1980s, Cuba was conducting around 80 percent of its external commercial relations with the member countries of the CMEA. This group of countries was purchasing the majority of Cuba’s total exports (63 percent of sugar, 73 percent of nickel, 95 percent of citrus), and was the origin of around 86 percent of Cuba’s total imports including 63 percent of food, 86 percent of raw materials, 98 percent of fuels and lubricants, 80 percent of machinery and equipment, and 57 percent of chemical products (Alvarez González and Fernández Mayo, 1992, pp. 4-5). Furthermore, the trade relations between Cuba and the CMEA took place under favorable terms of trade for the Cuban economy. For example, Alvarez González and Fernández Mayo (1992, p. 4) estimate that, during the period 1980 to 1990, Cuban import revenues were about 50 percent higher than they would have been if their exports had been sold at world market prices. In 1989 Cuban imports exceeded 8 billion pesos, but by 1992 they had decreased to 2 billion pesos for a decline in value of more than 70 percent in only three years (Alvarez González and Fernández Mayo, 1992, pp. 4, 8). As a result, the living standard of the general populace in Cuba deteriorated during the Special Period. Food availability in the official distribution system (rationing system) continually worsened, oil shortages for power generation grew so critical that rolling power black outs became a regular part of life throughout the country, and gasoline and repair parts for automobiles and buses became so scarce that a large proportion of the population was relegated to using bicycles as their primary means of transportation. However, perhaps the most significant event of the Special Period was the development of food scarcity into a crisis. Food scarcity in revolutionary Cuba is not a new phenomenon. It dates back to 1962 when it was the motivation for the introduction of the rationing book. Wide variations in food availability (in terms of both quantity and variety) have been experienced since that time. The present crisis is the result, in order of importance, of the inefficiencies inherent to central planning, the demise of the Council of Mutual Economic Assistance (CMEA), and the U.S. economic embargo. Research has not only shown differences in productivity but also disparities in income levels among workers in farms with different agricultural production. Field research conducted in three different Cuban municipalities show that peasant households (in regions characterized by sugarcane, mixed cropping, and livestock production) generate the highest income levels in the agricultural sector. Moreover, private sector incomes were considerably higher than those of households of state farm wage workers (Deere et al., 1995). According to these authors, the relatively high incomes earned by members of Agricultural Production Cooperatives are indicative of the higher profitability and, hence, productivity of Cuba’s production cooperatives as compared to the state farms (p. 231). Nova González (1994) confirms that, in the last fifteen years, and particularly since 1986, Cuba’s agricultural and livestock activities in general experienced production declines, loss of efficiency, and/or stagnation in key production areas. This happened despite the strong investment process that took place in agriculture (around 30 percent of total investments in the country during the decade of the 1980s), the high availability of tractors, high use of nutrients per hectare, as well as continuing increases in productive expenses and in the labor force. Furthermore, while 39 percent of state agricultural enterprises showed positive financial results in 1986, only 27 percent did so in 1990. The Food Plan (Plan Alimentario, PA) was the most recent attempt at solving Cuba’s food problem through central planning. 3 Although this plan dates back to the mid-1980s following the closing of the free farmers’ markets, it increased in importance after the establishment of the Special Period in September of 1990. The general objective of the PA was to make Cuba self-sufficient in most agricultural commodities. After initial mixed results, and facing increasingly labor and input shortages, the PA was abandoned in 1993.
to develop the autonomy of management and to administer their resources with the objective of achieving self-sufficiency in the productive process. fulfill the corresponding fiscal responsibilities as their contribution to the general expenditures of the Nation. One of the indications of the magnitude of the change is the difference in average farm size between state enterprises in 1990 and UBPCs in 1994 (Table 1). 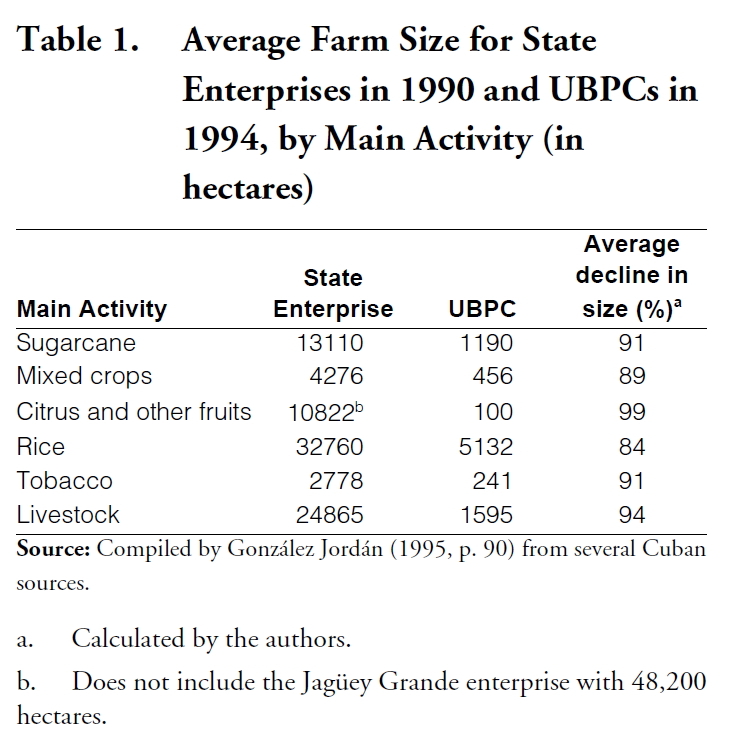 Although the Table reflects the average UBPC to be less than 10 percent of the size of the average state farm, González Jordán (1995, p. 91) believes that the average UBPC size is still too large and may be the reason for their low productive and economic efficiency. During several field visits conducted by the authors during 1994, 1995 and 1996, cooperative leaders and members provided useful information concerning their experiences with the UBPCs’ establishment and organization. 6 Former state farm workers were given the option of becoming members of the new UBPC and the coop members elected their leaders (referred to as a “Direction Board”) from among their membership. Cooperative members also have the right to vote on the addition of new members and the termination of members who may not be adequately conducting their duties at the UBPC. UBPCs were given the right to farm their land in perpetuity, although title to the land remains with the state. While in some cases, each UBPC was assigned a proportionate share of machinery and equipment from the former state farm (without any input from coop members); in other cases the members selected the amount and type of machinery and equipment they wanted to purchase from the state enterprise. However, each coop has complete control over which and how many of the pieces of equipment they maintain and use. Provisions were made with the Cuban National Bank for the UBPCs to obtain low interest loans to purchase the machinery and equipment from the state. This autonomy is expected to develop as part of the process of negotiating production quotas which occurs annually between the UBPC Direction Boards and the state. Annual “production potentials” (i.e., goals) for the principal commodities produced by the UBPC are initially based upon a proportionate share of the previous state farm’s quota. However, UBPC Board members hope that, over time, they may be able to convince the state negotiators to allow them to increase the production of crops which they are more efficient at producing and decrease those which they are less. With the opening of the agricultural markets (discussed later in the paper), policy changes were also implemented for the UBPCs which provided important production incentives. Once the production goals are agreed upon between the state enterprise and the UBPC Direction Board, the UBPC quota for sale to acopio is established at 80 percent of the overall production goals. This quota is broken up into monthly commitments levels. The UBPC is free to sell the remaining 20 percent of the production goal and 20 percent of any excess above the production goal to the agricultural markets. and benefits when deciding where to market their surplus. Indeed, two neighboring UBPCs visited made different decisions with regard to where to market their crops because they produced different commodities. For one of them, the additional cost of transporting their crops to markets in the city of Havana was more than offset by the lower taxes and high prices which they received while the other UBPC elected to sell in the local markets because their crops did not command a sufficient premium in the city market. The UBPC Simón Rodríguez sells its surplus of mixed crops in the city, while the neighboring UBPC Fidel Borrego elected to sell its bananas and plantains locally. Furthermore, UBPCs do not actually need to produce any volumes beyond that which they are obligated to sell to acopio. For example, some UBPCs that were visited had found that, since bananas and plantains remained relatively plentiful in Cuba at that time, the price which they received for these products in the agricultural markets did not even cover their production costs. These UBPCs therefore had chosen to only produce their quota requirements of bananas and plantain for acopio and reallocate the inputs (labor as well as limited amounts of fertilizer and pesticides) to production of crops which will return a profit. Actually, the UBPC members do not use the term profit, preferring instead to use the term “surplus.” These surpluses are extremely important because, in addition to being the source of funds that the UBPC uses to pay off its equipment loans, they also are the source of incentive compensation to the individual workers. Despite their different areas of specialization, all UBPC members are considered to be the same level and generally receive the same base wage for their work. Individual UBPCs have a great deal of flexibility in how they structure the incentive system for distributing their surplus. For example, one UBPC visited divided their members into three-person work brigades. Each brigade was assigned a specific small plot of land and their compensation from the UBPC surplus was tied to the level of production which they were able to generate on their plot. This arrangement requires an elaborate system of record keeping and control and not all UBPCs choose to use such a complex system. Indeed, the structure of the system varied depending upon both the type of crops produced and the mix of crops within the UBPC. UBPCs which produced a large variety of crops recognized the difficulties in measuring productivity of the individual members or groups of members when they were producing different crops and their systems therefore tended to share the surplus fairly equal among members. Conversely, UBPCs which produced chiefly a single crop tended to have more elaborate methods of measuring productivity to provide incentives to the individual members or groups of members. One UBPC was actually attempting to adjust its compensation plan for work brigades whose plots were on the windward side of banana fields because of losses which their plots sustained from heavy winds and storms. The similarities between the Agricultural Production Cooperatives (CPAs) and the UBPCs are obvious. In fact, the latter were developed following the economic framework and the means of collective and individual remunerations of the former. The only major exception is land ownership in legal terms. CPA members are the owners of their land while the UBPC leases state lands for an indefinite period of time. An additional difference exists on members’ affiliation to a mass organization. CPA members belong to the National Association of Small Farmers (ANAP). UBPC members, on the other hand, remain enrolled in the Agricultural, Livestock, and Forestry Workers’ Union. Under this arrangement, CPAs have a greater degree of autonomy than UBPCs. Although we believe the autonomy issue to be a temporary difference, it surfaced dramatically during a visit to one sugarcane CPA and a neighboring sugarcane UBPC a few weeks after the conclusion of the 1993-94 sugarcane harvest. The CPA had standing cane belonging to different stages of the production cycle. The UBPC did not. The CPA officials had refused to harvest any of this cane in order not to disrupt the normal production cycle despite pressure from the CAI. The contiguous UBPC, however, had to yield to the CAI’s “persuasion” to fulfill a national production goal. This difference is explained by the fact that, from the outset in the mid-1970s, the CPA members have been the owners of their land and equipment and had been granted a degree of autonomy they were not willing to relinquish. The performance of the UBPCs is very difficult to evaluate for two obvious reasons. First, it is a very short period of time to allow the UBPCs to grow and mature; and, second, this drastic transition has taken place within an economy going through its worst economic crisis in many decades. What follows is a summary of statistics provided by Cuban officials and a description of the results of two major efforts aimed at finding the causes for the first-year apparent disappointing performance. Although established in late 1993, UBPCs’ preliminary performance results were being released in early 1995. According to Alfredo Jordán, Minister of Agriculture, Cuban agricultural production in 1994 (1,050,000 short tons), declined by 200,000 short tons when compared with the previous year, and by 600,000 short tons when compared with 1992. The figures include total production (grains, fruits, tubers, roots, and vegetables) except sugarcane (Alfonso, 1995b). Later, the National Council of the Agricultural, Livestock, and Forestry Workers’ Union met to analyze the losses and low productivity inherited by the UBPCs from the former state farms. Salvador Valdés, general secretary, enumerated a long list of material difficulties the UBPCs are facing (Alfonso, 1995d), most of which are discussed later in this section. The sugarcane UBPCs did not fare any better. In mid-March of 1995, Raúl Trujillo, first deputy Minister of MINAZ stated that, during the 1993-94 harvest, only 127 (9 percent) of the 1,426 UBPCs in operation increased production and generated profits; another 712 (50 percent) have many problems that could be solved within a one-year period, while the remaining 587 (41 percent) show a series of problems without immediate solution (Alfonso, 1995c). The release of these statistics generated opposite reactions among scholars who study the Cuban situation. Carmelo Mesa-Lago, a professor of Economics at the University of Pittsburgh, stated: “The co-ops are not working. They don’t have the proper incentives. The majority of the cooperative members say, ’Why should I be productive for the state, if the state is going to pay me much less?’” Julio Carranza, an economist with Havana’s Center for the Study of the Americas, however, believes that the “UBPCs constitute the transformation of the economy. Results are not high enough, but that does not mean they are a mistake. It’s just that they haven’t matured” (Alvarez, 1995, p. 4A). Two studies conducted in Cuba may shed some light on the issue. ation to all members to their productive results; (c) obtain the necessary working tools; (d) satisfy the food needs of the workers and their families; and (e) advance in the building of housing for their members. A questionnaire was developed to obtain information on actions taken and date of expected fulfillment of the previous goals. A sample of 774 UBPCs was drawn from Cuba’s 14 provinces and the Special Municipality of the Isle of Youth in May 1995, resulting in 630 actual UBPCs visited. The interviews were conducted in pairs by 1,100 students of the provincial schools of union leaders during one week. Most of the UBPCs visited included sugarcane, miscellaneous crops, and cattle. advance in the building of housing for their members: Of the 20,250 dwellings needed, there is a deficit of 10,273 units, or 50.7 percent. Livestock UBPCs show the lowest shortage (30.2 percent), while citrus UBPCs have the highest (78.9 percent) (pp. 15, 16). Housing needs are expected to be fulfilled between 1998-2010 because of the current lack of construction materials (p. 17). The second study was directed by Polo Científico de Humanidades (1995) at the University of Havana (UH), although actual participation included seven research centers at the UH and three at other institutions. 12 This project consisted of several multidisciplinary efforts with the common goal of researching problems in the UBPCs in the provinces of La Habana, Cienfuegos, Ciego de Avila and Granma through the use of questionnaires and surveys. immediate effect of the establishment of the agricultural markets: Although not fully discernible yet, there appears to be a positive impact on production increases in UBPCs of miscellaneous crops. This issue should be investigated in sugarcane UBPCs. Initially, the UBPCs operated under the same system as the CPAs, where they sold their quota volumes to the state at the fixed official price and they received a premium for production in excess of their quota. During the late 1980s this system provided incentives for the CPAs to produce in excess of their quota levels and sell the extra production to the state. However, food shortages which developed in the early 1990s caused a dramatic increase in prices on the black market, thus the incentive to sell excess production to the state declined significantly (Deere, 1995, p. 15). On September 19, 1994, the Council of Ministers enacted Decree No. 191 establishing the agricultural markets (Pagés, 1994, p. 3). 14 The main objective of these markets is to increase the production levels of food intended for the population’s consumption. The MA are organized by the Bureau of Commerce of the Administrative Councils of Popular Power, who determine the number and location of these markets in each municipality. Only the surplus beyond the production agreement between the farmers and the state agency will be saleable at the MA. Thus, the more production, the higher the quantities that will be available to be sold at prices agreed upon freely between buyers and sellers. Sellers have to pay a tax for the space and other services provided. The Administrative Councils supervise and control the functioning of the MA, according to current regulations. Producers who fail to fulfill their obligations with the state but sell in the MA will have to pay a penalty equal to the product of multiplying the unfulfilled volume times the highest price at the MA at the time of the violation. The Ministries of Agriculture and Internal Trade will be responsible for regulating the organization and functioning of these markets. In addition, the Ministries of the Revolutionary Armed Forces, Interior, and other state central organizations, will establish their own regulations to participate in the MA. On September 30, 1994, the Ministries of Agriculture and Internal Trade signed a Joint Resolution regulating the participation in, and products to be sold at, the MA (Pagés, 1994, p. 3). The following entities and individuals, or their appointed representatives, will be able to participate in the agricultural markets: (a) state farms and enterprises; (b) non-cane basic units of cooperative production (UBPC); (c) agricultural production cooperatives (CPA); (d) farms under the Working Youth Army (Ejército Juvenil del Trabajo, EJT); (e) cooperatives of credit and services (CCS) representing their members; (f) small farmers; (g) budgeted enterprises and units that produce in their areas for self-consumption; (h) producers in areas allocated for family self-consumption; and (i) producers in yards and small parcels. be entirely contracted with the state). The sale of some of these products, however, may be authorized in certain periods and territories. demand, price movements, conditioning and organization: The presence of consumers, especially in the city of Havana, was very high in the first days and continued at high levels thereafter. For example, the total national value of sales was of 14.5 million pesos in the first two days, and of 61.9 millions during the first 15 days. During the first days of operation, prices in the MAs were high in relation with the purchasing power of average Cubans. 16 Sellers price their products according to market conditions at the beginning of the day. Prices are adjusted throughout the day depending on a variety of factors. However, a negative influence is the fact that taxes are imposed based on the price of the products at the beginning of the day. The average tax is of 8 percent of the gross value, but it is 5 percent in the city of Havana and 15 percent in other areas of the country. The MA occupy the facilities where previous markets and the MLCs were located. Availability of facilities and equipment is low and varies from place to place. Warehouses are scarce. Times of operation are not fixed. proof of having met their delivery quotas to the state. Second, MAs are subject to a taxing system that has been designed to generate revenues for the state during the current economic crisis. 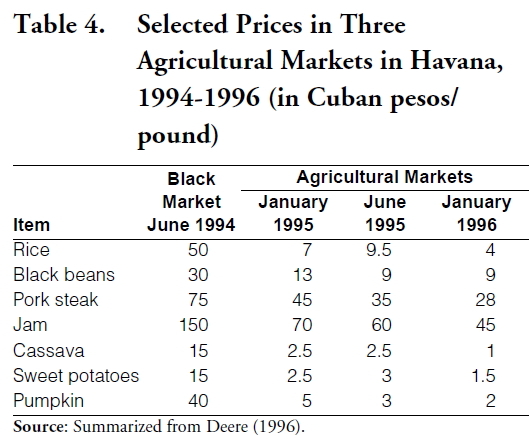 It ranges from 5 percent of the value of projected gross sales in the city of Havana (to channel the greatest volume to the capital, where food shortages are potentially the most politically volatile) to 15 percent in the small, rural markets of the interior (Deere, 1995, p. 16). And third, as opposed to the MLCs where this phenomenon was insignificant, sales of processed foods are an important part of the new MAs (Torres and Pérez, 1994, p. 36). Although the previous section also contains some description of the early performance of the agricultural markets, there are additional important issues for discussion. Torres and Pérez (1994, pp. 39-41) report a series of statements from both buyers and sellers about the benefits and early performance of the MA. In general, they deal with the advantages of the access to the markets by the working population, the availability of fresh products as opposed to the ones purchased in the state stores, and the expectations about future declines in prices. The first specific positive impact of the MA has been the lowering of prices that had prevailed in the black market (Scarpaci, 1995, p. 14). For example, the presence of the state enterprises was responsible for bringing the price of pork down from its June 1994 black-market level of 75 pesos to 45 pesos per pound. Also, rice prices in the black market were around 50 pesos per pound in June 1994 but decreased to between seven and 10 pesos per pound in January 1995 in the MAs. Similarly, the price of cassava went down from 15 pesos a pound to between two to three pesos during the same time period (Deere, 1995, p. 16). More detailed (sometimes contradictory) information appears on Tables 3 and 4. However, prices still remain high relative to the purchasing power of the average consumer. 17 On the other hand, quantities sold have remained relatively stable (Table 5), while independent farmers seem to control the highest percentages of most of the commodities sold in the markets (Table 6). Perhaps the most important contribution of the agricultural markets to the economy in general has been the depreciation of the U.S. dollar in relation to the Cuban peso. Deere (1995) states that the dollar reached a peak of 120 pesos in the black market in July 1994. By the following June, the dollar was valued at between 30 to 35 pesos (p. 17). During the authors’ last visit in the spring of 1996, the exchange rate of the dollar had declined to between 21 and 23 Cuban pesos. Who would have thought that we, so doctrinaire, who fought foreign investment, would one day view foreign investment as an urgent need? This quote is a powerful confirmation of the magnitude of the transformation which is currently under way within Cuba. 18 The two most important changes in the agricultural sector have been partially described in this paper. The establishment and organization of the UBPCs and MAs have important implications for future agricultural productivity. Since the two organizations are complementary, the issues are discussed together. The production takeoff of agricultural food did not materialize as expected six months after the opening of the agricultural markets in the island [Official sources]. The production increase due to the stimulus of participating in this market has not been achieved yet. Although the overstocking of the stands may point to the contrary, all seems to indicate that what is being sold “already existed” but, simply, was not delivered to the state collection agency. A good portion of these products were being sold in the black market and at prices even higher than those being exhibited now in the agricultural markets where the law of supply and demand governs [Granma]. From October through March [of 1995], these markets only sold 19 percent of the total tons of agricultural products distributed to the population, although their variety is wider than the one collected and sold by the state in the places of rationed sales [Official sources]. As a farmer, one has to fulfill a quota of sales to the state but the payment is sometimes laughable. You sell and, when you go to the nearest’s town market, you find your orange three or four times more expensive [An independent producer]. The fact that prices in agricultural markets do not go down is another more than sufficient proof that agricultural production has not experienced the expected takeoff. “When it happens, deliveries to the state collection agency as well as supplies will increase, and prices will tend to decrease,” specialists stated [Granma]. The Cuban countryside has been stagnant during a long period of time and one can not revive it overnight. One has to plant and wait for the results [An anonymous economist]. In fact, while the economy as a whole experienced a modest growth of 0.7 percent in 1994 with respect to 1993 (Oficina, 1995, p. 3), activity in the agricultur al sector decreased by 4.9 percent (p. 4). Modest growth was present in rice, corn, fruits, milk, eggs, and poultry and pork, while viandas and vegetables decreased by 16.6 percent (p. 5). yond the established production goal since 80 percent of any surplus will also have to be sold to the state agency at very low prices. 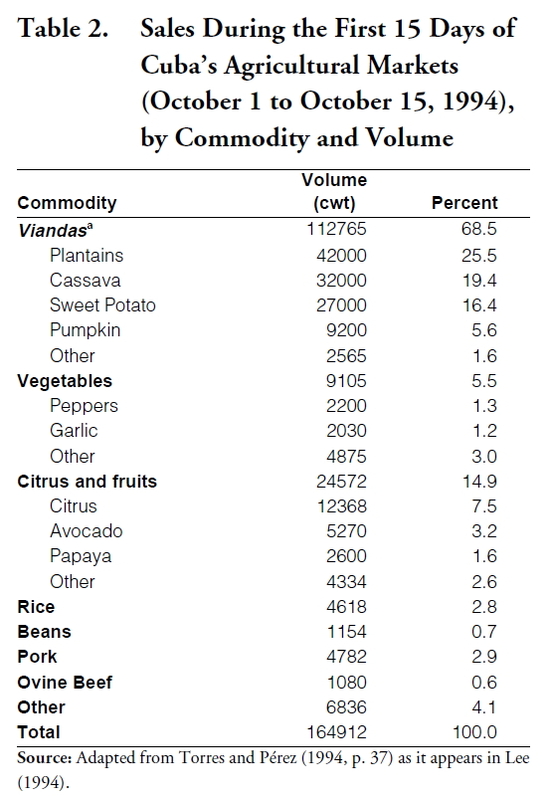 An important point is that most agricultural markets have a relative abundance of multiple agricultural commodities. When one observes this fact, the question arises about the remaining 80 percent that was supposed to be delivered to acopio since most of these products are not available in the ration stores. After examining the differences in gross and net revenues (Table 7) and average costs of production (Table 8) between the state and non-state sectors, one wonders about the reasons for the existence of some state farms. There is speculation that some state farms are being held by the government as potential joint venture operations. Or, it simply may be that, since the majority of state farms have already been converted to UBPCs, the incentive to complete the process has decreased. Nevertheless, the fact that the majority of state farms have been broken up into UBPCs is a clear indication of the commitment on the part of the Cuban government to this fundamental policy change. important in any discussion of the implications of the two new agricultural entities. Acopio has been the official link between producers and consumers since the early years of the revolution. Fruits, to avoid drastic decreases in farmers’ incomes after the closing of the free farmers’ markets (Torres and Pérez, 1994, p. 30); and (d) investing in additional refrigerated trucks and warehouse facilities (Deere and Meurs, 1992). number of state officials; and (b) as discussed earlier, the continuing state intervention on farmers’ cooperatives. Facing the economic realities of the Special Period within a process of economic reforms in the agricultural sector, one has to wonder about the feasibility of maintaining a system originally designed to operate within a highly centralized and subsidized agricultural sector. The debate has already started in Cuba. Carriazo (1994) states that the UBPCs are tied to a system of acopio, inefficient by itself and now suffering greater limitations such as in transportation and containers (p. 23). And he adds that “Acopio’s pricing system reveals its rigidity by not reflecting with the required celerity the changes in supply, demand, quality, cost and other factors” (p. 24). He ends by questioning whether the UBPCs should be required to render all of their production to a system of acopio traditionally inefficient and lacking transportation resources (p. 24). González Jordán (1995, p. 91) criticizes Acopio’s current pricing system for not “stimulating” either production or sales to the state. The reason is low prices that do not correspond with the economy’s general price level. Orlando Lugo, president of the National Association of Small Farmers (ANAP) has stated that the mechanisms developed through Acopio are now obsolete, and the norms used by Acopio to purchase from the farmers do not respond to the present realities (García Luis, 1994, p. 5). Some of the early difficulties due to the lack of transportation have been mitigated. Soon after the creation of the agricultural markets, Resolution 178/94 of the Ministry of Transportation authorized state enterprises and private parties involved in public service activities, who posses the corresponding operative license, to engage in the transportation of products to the markets. This, however, is a timid step. More radical reforms are needed. For example, Torres and Pérez (1994), in addition to several recommendations to improve the markets, one could also think in the explosion in the number of commercialization chains, marketing cooperatives and others that would serve as the intermediaries between producers and consumers, taking charge of the purchase, transport, cleaning, promotion and sales. Such chains would not only operate in the agricultural markets, but in supermarket chains and other small businesses (p. 42). The above recommendation does not seem to enjoy official support at present. At the end of May 1996, the weekly Trabajadores (official organ of the Confederation of Cuban Workers, CTC) sent a strong message to the “new rich”, alluding specifically to the middlemen in agricultural markets (Noticias, 1996, 1B). A few days before, however, Vice-President Raúl Castro, in an unusual open letter to the Minister of Agriculture published in the official daily Granma, strongly criticized the state Acopio system. He stated that one-fourth of agricultural commodities intended for distribution under the state system for Havana residents in April were rotten and had to be discarded (Raúl, 1996, p. 9A). Such problems, however, have been constantly present. Pérez Marín and Muñoz Baños (1991, p. 4), for example, estimated losses of 225 kg/ha (13 kg/capita) in tubers, roots, vegetables and grains left unharvested in the fields. The statement “it depends on the market” was the reply received by the authors on numerous occasions from UBPC Direction Board members in response to questions related to how they decide what commodities to send to the market, which market (city or local) to send their crops to or when to send them. This demonstrates that, despite having lived for over 30 years under a planned economic system, there is an understanding of the operation of markets. The degree of control and autonomy which UBPC members have in the operation of their coop is certainly limited as compared to what farmers in market economies have. However, even this limited ability to influence production and marketing decisions is a substantial improvement over their days as workers on large state farms. As a result, UBPC members are beginning to feel a new sense of stewardship toward the land and other productive assets. At the same time, they recognize the UBPC as a mechanism to potentially improve their personal well being. These are important incentives, but, they will not continue to motivate without further reinforcement. The decision to dismantle the state farms into UBPCs and to establish the agricultural markets would appear to have created a window of opportunity for the Cuban government to improve domestic agricultural production and food availabilities. As discussed earlier in this paper, obstacles still exist which hinder the efficient operation of these new institutions in Cuba. Even if these obstacles are removed, chronic shortages of fertilizers, pesticides and fuel oil will restrict the ability of the agricultural sector to respond in dramatic fashion. However, if the obstacles are not removed, the failure to increase agricultural output and food accessibility could potentially lead to another food crisis and further civil unrest. “Acuerdo del Buró Político: Para Llevar a Cabo Importantes Innovaciones en la Agricultura Estatal,”Granma (September 15, 1993), p. 1. Alfonso, Pablo. “Cobra Auge Entrega de Tierras a Trabajadores Agrícolas,” El Nuevo Herald (February 21, 1995a), p. 1B. Alfonso, Pablo. “Producción Agrícola Continúa su Descenso,” El Nuevo Herald (January 10, 1995b), p. 3A. Alfonso, Pablo. “Sin Avance las Cooperativas Cañeras,” El Nuevo Herald (March 10, 1995c), 1B. Alfonso, Pablo. “Son Improductivas las Cooperativas Agrícolas,” El Nuevo Herald (January 13, 1995d), p. 3A. Alonso, José. “The Free Farmers’ Markets: A Rejected Approach but a Possible Solution,” Cuba in Transition— Volume 2. Washington: Association for the Study of the Cuban Economy, 1992, pp. 166-184. Alvarez González, Elena and María Antonia Fernández Mayo. “Dependencia Externa de la Economía Cubana,” Documento INIE. Ciudad de la Habana: Instituto de Investigaciones Económicas, 1992. Alvarez, José and Ricardo A. Puerta. “State Intervention in Cuban Agriculture: Impact on Organization and Performance,” World Development 22:11 (1994), pp. 1663-1675. Alvarez, Lizette. “Using Capitalism to Save Socialism,” The Miami Herald (March 28, 1995), pp. 1A, 4A. Báez, Luis. “Entrevista a Raúl Castro: Si Hay Comida Para el Pueblo no Importan los Riesgos,” Trabajadores (September 19, 1994). Benjamin, Medea, Joseph Collins and Michael Scott. No Free Lunch: Food and Revolution in Cuba Today. New York: Grove Press, Inc., 1986. Bromley, Daniel W. “Revitalizing the Russian Food System Markets in Theory and Practice,” Choices (Fall Quarter 1993), pp. 4-8. Colectivos Laborales de Nuevo Tipo: Resumen de Investigaciones Sobre las UBPC. La Habana: Programa Flacso, Universidad de la Habana, January 1995, pp. 39-41. Carriazo, George. “Cambios Estructurales en la Agricultura Cubana: La Cooperativización,” Economía Cubana Boletín Informativo, No. 18, Centro de Investigaciones de la Economía Mundial ( November 1994), pp. 14-29. Castillo Díaz, Miguel. “Trabajo de Organización Contable: UBPC ’Marcos Martí,’ Municipio Quivicán,” in Polo Científico de Humanidades (Ed. ), Colectivos Laborales de Nuevo Tipo: Resumen de Investigaciones Sobre las UBPC. La Habana: Programa Flacso, Universidad de la Habana, January 1995, pp. 37-38. Comité Estatal de Estadísticas. “Unidades Básicas de Producción Cooperativa -UBPCCaracterísticas de las UBPC y Algunos de los Cambios Provocados en el Sector Agropecuario con su Introducción,” Dirección Agropecuaria y Silvicultura, La Habana, August 1994. Coordinación. “Introducción,” in Polo Científico de Humanidades (Ed. ), Colectivos Laborales de Nuevo Tipo: Resumen de Investigaciones Sobre las UBPC. La Habana: Programa Flacso, Universidad de la Habana, January 1995, pp. 1-9. “Cuba: Hechos y Cifras,” Economía Cubana Boletín Informativo, No. 25, Centro de Investigaciones de la Economía Mundial (January-FebruaryMarch 1996), pp. 20-31. Deere, Carmen Diana. “Cuba’s National Food Program and Its Prospects for Food Security,” Agriculture and Human Values 10:3 (Summer 1993), pp. 35-51. Deere, Carmen Diana. “Implicaciones Agrícolas del Comercio Cubano,” Economía Cubana Boletín Informativo, No. 18, Centro de Investigaciones de la Economía Mundial (November 1994), pp. 3-14. Deere, Carmen Diana. “Reforming Cuban Agriculture: The Challenges of the 1990s,” unpublished manuscript (March 1996). Deere, Carmen Diana. “The New Agrarian Reforms,” NACLA Report on the Americas 29:2 (September/October 1995), pp. 13-17. Deere, Carmen Diana, Ernel Gonzales, Niurka Pérez and Gustavo Rodríguez. “Household Incomes in Cuban Agriculture: A Comparison of State, Cooperative, and Peasant Sectors,” Development and Change 26:2 (April 1995), pp. 209-234. Deere, Carmen Diana, Niurka Pérez and Ernel Gonzales. “The View From Below: Cuban Agriculture in the ’Special Period in Peacetime,’” Journal of Peasant Studies 21:2 (January 1994), pp. 194-234. Díaz, Beatriz et al. “Cooperativización Agrícola: Retos y Alternativas. Estudio de Caso en la UBPC de Cultivos Varios ’Marcos Martí’, Quivicán,” in Polo Científico de Humanidades (Ed. ), Colectivos Laborales de Nuevo Tipo Resumen de Investigaciones Sobre las UBPC. La Habana: Programa Flacso, Universidad de la Habana, January 1995, pp. 31-36. Economics Press Service. “Agricultura: Mercado Agropecuario no Disparó la Producción de Alimentos,” Información Quincenal Sobre Cuba, Año 8, No. 7 (April 15, 1995), pp. 6-7. Economics Press Service. “Mercado Agropecuario: Precios Estremecen los Bolsillos Cubanos,” Información Quincenal Sobre Cuba, Año 9, No. 4 (February 29, 1996), pp. 13-14. Espinosa, Juan Carlos. “Markets Redux: The Politics of Farmers’ Markets in Cuba,” in Cuba in Transition— Volume 5. Washington: Association for the Study of the Cuban Economy, 1995. Gaceta Oficial de la República de Cuba (September 21, 1993), p. 15. García Luis, Julio. “Lo Principal es Cómo Elevar la Producción y el Acopio, que es lo que Salva al País,” Trabajadores (July 11, 1994), p. 5. González Jordán, Benjamín. “La Agricultura Cubana: Un Balance Crítico,” Economía y Desarrollo 118:2 (December 1995), pp. 81-97. González Surribas, Aracely and Eliézer Jhones Menéndez. “Sistema Computacional A3CAI: Actividad Agropecuaria de Autoconsumo en los CAI Azucareros,” in Polo Científico de Humanidades (Ed. ), Colectivos Laborales de Nuevo Tipo Resumen de Investigaciones Sobre las UBPC. La Habana: Programa Flacso, Universidad de la Habana, January 1995, pp. 26-30. Junta Directiva. “Informe Anual de la CPA,” Cooperativa de Producción Agropecuaria “Amistad Cuba Laos,” Bauta, Provincia de La Habana, July 1994, Mimeographed. Jústiz García, Elizabeth and Hilda Díaz Pérez. “Resumen de los Principales Resultados de la Investigación Socio-económica Dirigida a las Unidades Básicas de Producción Cooperativa Cañeras del País Durante 1994,” in Polo Científico de Humanidades (Ed. ), Colectivos Laborales de Nuevo Tipo Resumen de Investigaciones Sobre las UBPC. La Habana: Programa Flacso, Universidad de la Habana, January 1995, pp. 10-16. Lee, Susana. “Amplio Examen de las Experiencias del Mercado Agropecuario. Reunión de Presidentes de las Asambleas Provinciales,” Granma (October 20, 1994), p. 4. Limia David, Miguel and Graciela Salazar. “Las UBPCs Cañeras como Forma Embrionaria de Nuevo Tipo de Colectivo Laboral en Cuba,” in Polo Científico de Humanidades (Ed. ), Colectivos Laborales de Nuevo Tipo Resumen de Investigaciones Sobre las UBPC. La Habana: Programa Flacso, Universidad de la Habana, January 1995, pp. 17-19. Lorenzo Delgado, Raudel, Juan Molina Soto, Blanca Morejón Seijas and Gloria Valle Rodríguez. “Estudios Sociodemolaborales: Un Enfoque para la Investigación,” in Polo Científico de Humanidades (Ed. ), Colectivos Laborales de Nuevo Tipo Resumen de Investigaciones Sobre las UBPC. La Habana: Programa Flacso, Universidad de la Habana, January 1995, pp. 44-45. Martínez Figueredo, Antonio, Gregorio Núñez Lage and Argelio Castro Villa. “La Finca Lechera ’Siberia’ Hacia la Producción Sostenible,” in Polo Científico de Humanidades (Ed. ), Colectivos Laborales de Nuevo Tipo Resumen de Investigaciones Sobre las UBPC. La Habana: Programa Flacso, Universidad de la Habana, January 1995, pp. 47-50. Mesa-Lago, Carmelo. “The Cuban Economy in the 1980s: The Return of Ideology,” in Sergio D. Roca (Ed. ), Socialist Cuba Past Interpretation and Future Challenges. Boulder: Westview Press, 1988. Miranda Forés, Rubén et al. “Caracterización de la Producción y Comercialización en el Mercado Interno de los Productos Agrícolas,” in Polo Científico de Humanidades (Ed. ), Colectivos Laborales de Nuevo Tipo Resumen de Investigaciones Sobre las UBPC. La Habana: Programa Flacso, Universidad de la Habana, January 1995, p. 51. Molina Soto, Juan. “Estudios Sociodemolaborales: En la Rama Pecuaria (Resultado de Caso),” in Polo Científico de Humanidades (Ed. ), Colectivos Laborales de Nuevo Tipo Resumen de Investigaciones Sobre las UBPC. La Habana: Programa Flacso, Universidad de la Habana, January 1995, p. 46. Molina Soto, Juan and Ermela García Santiago. Informe Sobre el Perfeccionamiento de UBPC Seleccionadas. La Habana: Centro de Estudios Demográficos de la Universidad de la Habana and Escuela Nacional de Cuadros Sindicales Lázaro Peña, July 1995. “Noticias de Cuba,” El Nuevo Herald (May 28, 1996), p. 18. Nova González, Armando. “El Mercado Agropecuario Cubano,” Economía y Desarrollo 118:2 (December 1995a), pp. 65-79. Nova González, Armando. “La Reactivación Económica del Sector Agropecuario Cubano,” Economía y Desarrollo 117:1 (September 1995b), pp. 85-90. Nova González, Armando. “La Reorganización de la Agricultura en Cuba Factor Clave de la Estabilización Económica,” Instituto Nacional de Investigaciones Económicas (INIE), La Habana, May 1994, mimeographed. Nova González, Armando, et al. “Mercado Agropecuario: ¿Apertura o Limitación?,” Cuba: Investigación Económica No. 4, Instituto Nacional de Investigaciones Económicas (December 1995c), pp. 21-54. Nova González, Armando. “Mercado Agropecuario: Factores que Limitan la Oferta,” Cuba: Investigación Económica No. 3, Instituto Nacional de Investigaciones Económicas (October 1995d), pp. 63-72. Nova González, Armando. “Mercado Agropecuario: ’Futuro Escenario’,” Información Quincenal Sobre Cuba, Año 9, No. 4, Economics Press Service (February 29, 1996), pp. 21-22. Oficina Nacional de Estadísticas. “La Economía Cubana en 1994,” La Habana, June 1995. Pagés, Raisa. “Inversiones en la Agricultura No Cañera: No Presentamos un Negocio Color de Rosa,” Granma Internacional (May 10, 1995), p. 11. Pagés, Raisa. “Mercado Agropecuario: Decreto y Resolución,” Granma (September 21, 1994), pp. 1, 3. Pampin Balado, Blanca R. et al. “La Organización y Estimulación del Trabajo en la Producción Cañera. UBPC ’Jose Vázquez Martínez’ y CPA ’Amistad Cubano Nicarangüense,’” in Polo Científico de Humanidades (Ed. ), Colectivos Laborales de Nuevo Tipo Resumen de Investigaciones Sobre las UBPC. La Habana: Programa Flacso, Universidad de la Habana, January 1995, pp. 20-25. Peña Castellanos, Lázaro and José Alvarez. “The Transformation of the State Extensive Growth Model in Cuba’s Sugarcane Agriculture,” Agriculture and Human Values 13:1 (Winter 1996), pp. 59-68. Pérez-López, Jorge F. Cuba’s Second Economy: From Behind the Scenes to Center Stage. New Brunswick: Transaction Publishers, 1995. Pérez Marín, E. and E. Muñoz Baños. Agricultura y Alimentación en Cuba. La Habana: Editorial de Ciencias Sociales, 1991. Polo Científico de Humanidades. “Grupo: Estudios Socio-económicos de Producción Cooperativa y Campesina.” La Habana: Instituto Superior de Ciencias Agropecuarias de La Habana (ISCAH), n.d.
Polo Científico de Humanidades. Colectivos Laborales de Nuevo Tipo Resumen de Investigaciones Sobre las UBPC. La Habana: Programa Flacso, Universidad de la Habana, January 1995. “Raúl Castro Critica a Ministro por Derroche en Dura Carta Abierta,” El Nuevo Herald (May 27, 1996), p. 9A. Roca, Sergio G., “Reflections on Economic Policy: Cuba’s Food Program,” in Jorge F. Pérez-López (Ed. ), Cuba at a Crossroads: Politics and Economics After the Fourth Party Congress. Gainesville: University Press of Florida, 1994, pp. 94-117. Rodríguez Castellón, Santiago. “Algunas Consideraciones Sobre el Mercado Agropecuario,” in Polo Científico de Humanidades (Ed. ), Colectivos Laborales de Nuevo Tipo Resumen de Investigaciones Sobre las UBPC. La Habana: Programa Flacso, Universidad de la Habana, January 1995, pp. 52-54. Romero Valcárcel, Lázaro, Prisco Barroso Fernández and Ramón Díaz Menéndez. “Vías para el Perfeccionamiento de la Actividad Socioeconómica de la UBPC ’9 de Abril,’” in Polo Científico de Humanidades (Ed. ), Colectivos Laborales de Nuevo Tipo Resumen de Investigaciones Sobre las UBPC. La Habana: Programa Flacso, Universidad de la Habana, January 1995, pp. 42-43. Rosenberg, Jonathan. “Cuba’s Free-Market Experiment: Los Mercados Libres Campesinos, 19801986,” Latin American Research Review 27:3 (1992), pp. 51-89. Cuba in Transition— Volume 5. Washington: Association for the Study of the Cuban Economy, 1995. Centro de Investigaciones de la Economía Mundial (November 1994), pp. 29-42. Varela Pérez, Juan. “Nuevos Conceptos en la Agricultura: Mayor Autonomía en la Producción Cañera,” Granma (September 19, 1993), p. 3.